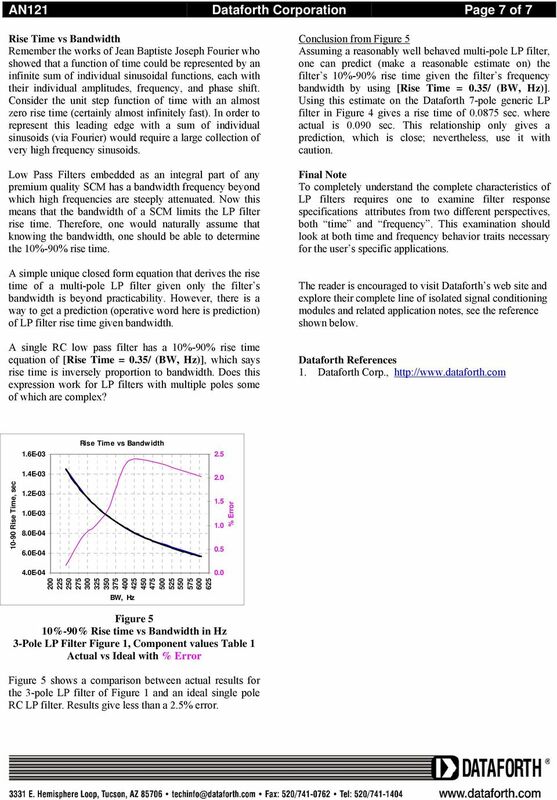 Download "Low Pass Filter Rise Time vs Bandwidth"
2 AN121 Dataforth Corporation Page 2 of 7 Special Reminder The term j used in the above equations is the symbol commonly used in electrical engineering (other disciplines often use i ) to represent an imaginary number. Now, there is nothing imaginary about this term, it represents an actual equation value, which is rotated 90 degrees from the x-axis (we call the x-axis the real-axis and the y-axis the imaginary-axis). The term imaginary number originated over a thousand years ago when early mathematicians did not know what to do with the square root of a negative number. Someone called it imaginary and the name stuck. Fortunately, Steinmetz and Euler showed us how to use this j notation in circuit analysis. Illustrative Example There are hundreds of LP filters circuit topologies; however, a very popular and widely used topology is the Sallen-Key circuit, shown in Figure 1. It is an active topology, very flexible, and easily manufactured thanks to the modern availability of high gain stable Op Amps (operational amplifiers). Filter response can be tailored by selected values of Rs and Cs; moreover, the amplifier gain G adds another powerful parameter for tailoring the filter response. In the circuit shown in Figure 1, components R4, C4, R5, C5, and the OP Amp constitute the active Sallen-Key circuit. The addition of R3, C3 adds a passive circuit contribution to the overall filter response. In these type topologies, the number of capacitors establishes the number of poles. More on poles later. This type LP filter topology is a popular workhorse, which Dataforth designers use to build multi-pole filters in their SCMs. Cascading circuits as illustrated in Figure 1 will implement multi-pole LP filters. For example, cascading two circuits as shown in Figure 1 with properly chosen Rs, Cs, and Gains creates a 6-pole LP filter. Taking out one passive RC section in this cascade string, creates a 5-pole LP filter (cascading a 2-pole and a 3- pole). Vin R3 C3 R4 Figure 1 Low Pass 3-Pole Filter Sallen-Key Active-Passive Combination R5 C5 C4 G Vout The voltage transfer function for a LP filter in Laplace notation is T(s) defined as Vout(s)/Vin(s), and is obtained by solving a set of circuit topology matrix equations using Laplace transform rules. The expression for T(s) of Figure 1 is the fraction N(s)/D(s) illustrated by Eqn. 1. N(s) G T(s) = =. Eqn 1 D(s) 3 2 b3*s +b2*s +b1*s+b0 Certain circuit topologies often have factors in the numerator N(s) that cause T(s) to approach zero at some frequency. For Figure 1 topology, N(s) = G in Eqn. 1 and there are no zeros. 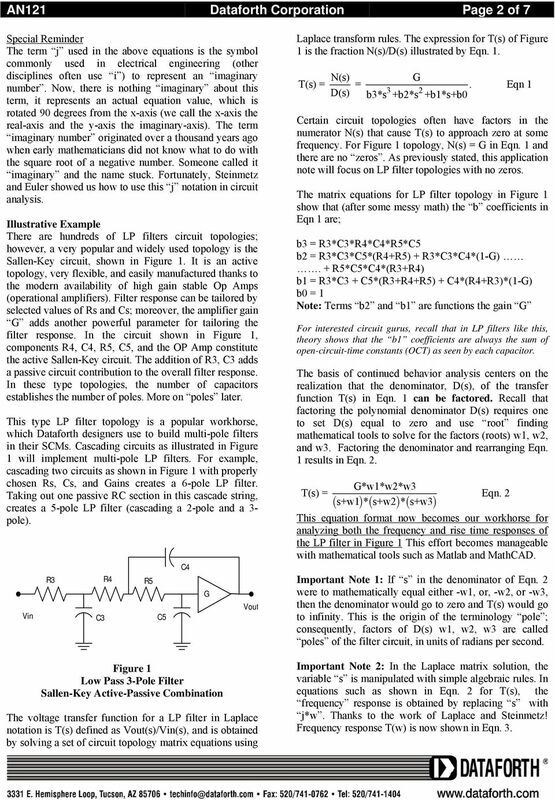 As previously stated, this application note will focus on LP filter topologies with no zeros. The matrix equations for LP filter topology in Figure 1 show that (after some messy math) the b coefficients in Eqn 1 are; b3 = R3*C3*R4*C4*R5*C5 b2 = R3*C3*C5*(R4+R5) + R3*C3*C4*(1-G). + R5*C5*C4*(R3+R4) b1 = R3*C3 + C5*(R3+R4+R5) + C4*(R4+R3)*(1-G) b0 = 1 Note: Terms b2 and b1 are functions the gain G For interested circuit gurus, recall that in LP filters like this, theory shows that the b1 coefficients are always the sum of open-circuit-time constants (OCT) as seen by each capacitor. The basis of continued behavior analysis centers on the realization that the denominator, D(s), of the transfer function T(s) in Eqn. 1 can be factored. Recall that factoring the polynomial denominator D(s) requires one to set D(s) equal to zero and use root finding mathematical tools to solve for the factors (roots) w1, w2, and w3. Factoring the denominator and rearranging Eqn. 1 results in Eqn. 2. G*w1*w2*w3 T(s) = Eqn. 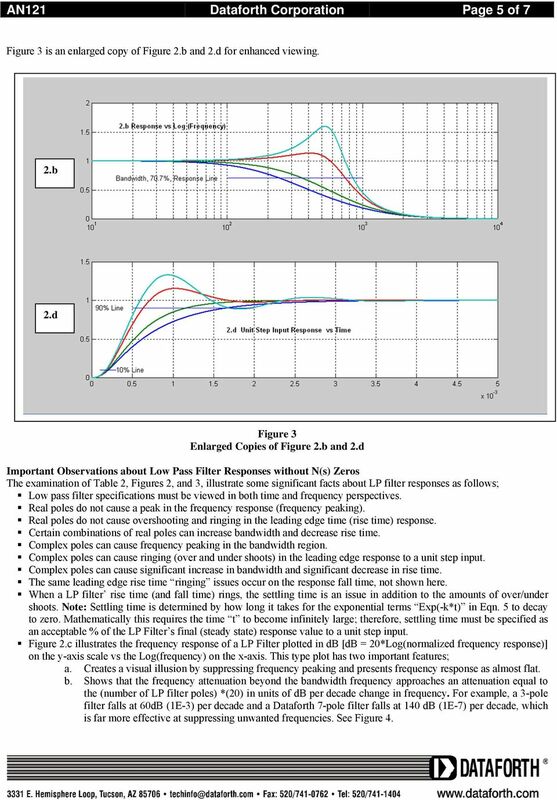 2 ( s+w1 )*( s+w2 )*( s+w3) This equation format now becomes our workhorse for analyzing both the frequency and rise time responses of the LP filter in Figure 1 This effort becomes manageable with mathematical tools such as Matlab and MathCAD. Important Note 1: If s in the denominator of Eqn. 2 were to mathematically equal either -w1, or, -w2, or -w3, then the denominator would go to zero and T(s) would go to infinity. This is the origin of the terminology pole ; consequently, factors of D(s) w1, w2, w3 are called poles of the filter circuit, in units of radians per second. Important Note 2: In the Laplace matrix solution, the variable s is manipulated with simple algebraic rules. In equations such as shown in Eqn. 2 for T(s), the frequency response is obtained by replacing s with j*w. Thanks to the work of Laplace and Steinmetz! Frequency response T(w) is now shown in Eqn. 3. 5 AN121 Dataforth Corporation Page 5 of 7 Figure 3 is an enlarged copy of Figure 2.b and 2.d for enhanced viewing. 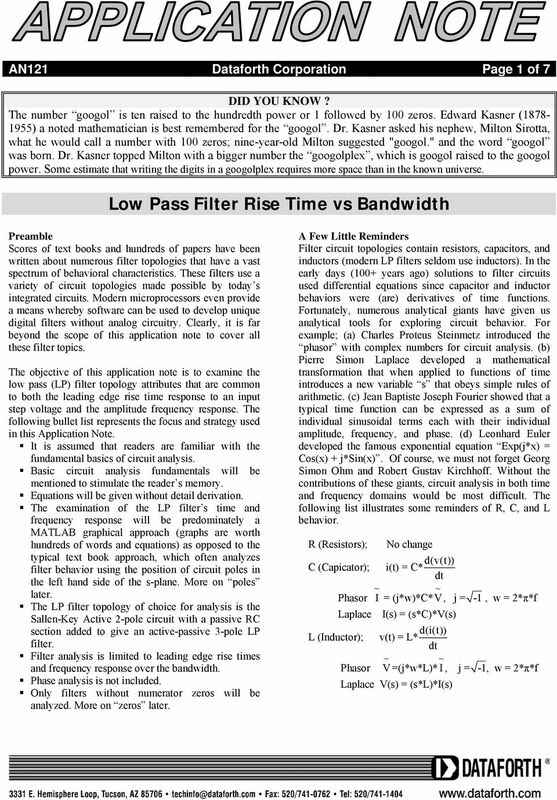 2.b 2.d Figure 3 Enlarged Copies of Figure 2.b and 2.d Important Observations about Low Pass Filter Responses without N(s) Zeros The examination of Table 2, Figures 2, and 3, illustrate some significant facts about LP filter responses as follows; Low pass filter specifications must be viewed in both time and frequency perspectives. Real poles do not cause a peak in the frequency response (frequency peaking). Real poles do not cause overshooting and ringing in the leading edge time (rise time) response. Certain combinations of real poles can increase bandwidth and decrease rise time. Complex poles can cause frequency peaking in the bandwidth region. Complex poles can cause ringing (over and under shoots) in the leading edge response to a unit step input. Complex poles can cause significant increase in bandwidth and significant decrease in rise time. The same leading edge rise time ringing issues occur on the response fall time, not shown here. When a LP filter rise time (and fall time) rings, the settling time is an issue in addition to the amounts of over/under shoots. Note: Settling time is determined by how long it takes for the exponential terms Exp(-k*t) in Eqn. 5 to decay to zero. Mathematically this requires the time t to become infinitely large; therefore, settling time must be specified as an acceptable % of the LP Filter s final (steady state) response value to a unit step input. Figure 2.c illustrates the frequency response of a LP Filter plotted in db [db = 20*Log(normalized frequency response)] on the y-axis scale vs the Log(frequency) on the x-axis. This type plot has two important features; a. Creates a visual illusion by suppressing frequency peaking and presents frequency response as almost flat. b. Shows that the frequency attenuation beyond the bandwidth frequency approaches an attenuation equal to the (number of LP filter poles) *(20) in units of db per decade change in frequency. For example, a 3-pole filter falls at 60dB (1E-3) per decade and a Dataforth 7-pole filter falls at 140 db (1E-7) per decade, which is far more effective at suppressing unwanted frequencies. See Figure 4. 6 AN121 Dataforth Corporation Page 6 of 7 Dataforth Signal Conditioning Module (SCM) Low Pass Filter Figure 4 represents a Dataforth SCM generic 7-pole LP filter frequency and unit step response. Dataforth designers are professionals with decades of experience in filter design. They balance the attributes of selected poles in multi-pole filter topologies to provide near ideal low pass filter behavior. Moreover, Dataforth realizes that industrial data acquisition and control systems must have premium high quality filters for noise suppression and aliasing prevention. 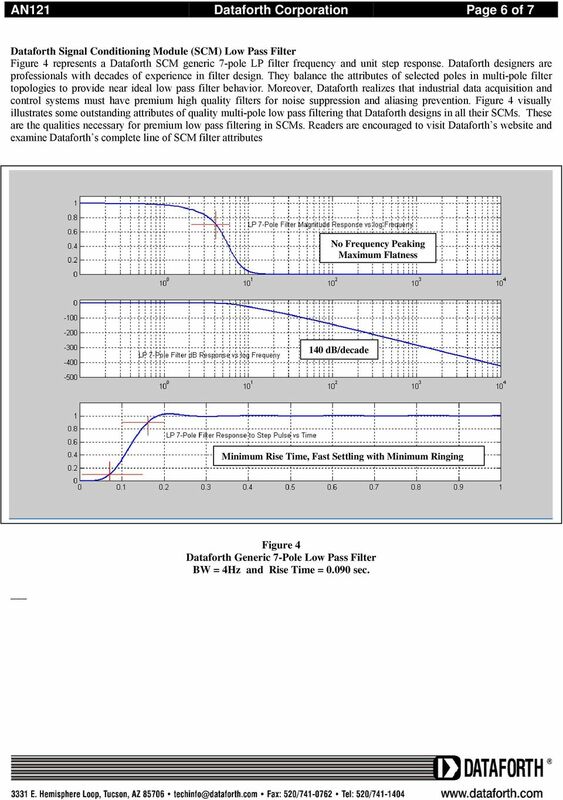 Figure 4 visually illustrates some outstanding attributes of quality multi-pole low pass filtering that Dataforth designs in all their SCMs. These are the qualities necessary for premium low pass filtering in SCMs. 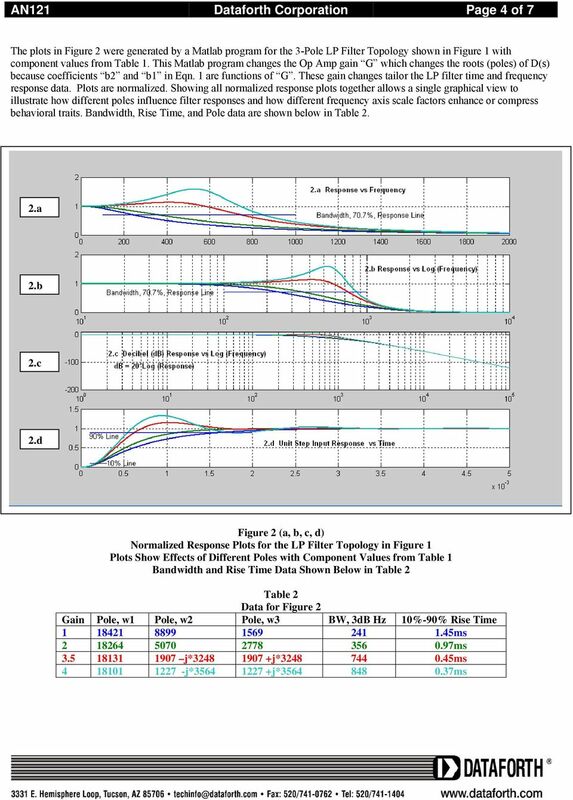 Readers are encouraged to visit Dataforth s website and examine Dataforth s complete line of SCM filter attributes No Frequency Peaking Maximum Flatness 140 db/decade Minimum Rise Time, Fast Settling with Minimum Ringing Figure 4 Dataforth Generic 7-Pole Low Pass Filter BW = 4Hz and Rise Time = sec. FREQUENCY RESPONSE AND PASSIVE FILTERS LABORATORY. We start with examples of a few filter circuits to illustrate the concept. A complex number W consists of real and imaginary parts a and b respectively, and the imaginary constant j which is the square root of negative one. Pocket book of Electrical Engineering Formulas Content 1. Elementary Algebra and Geometry 1. Fundamental Properties (real numbers) 1 2. Exponents 2 3. Fractional Exponents 2 4. Irrational Exponents 2 5. L and C connected together. To be able: To analyse some basic circuits. 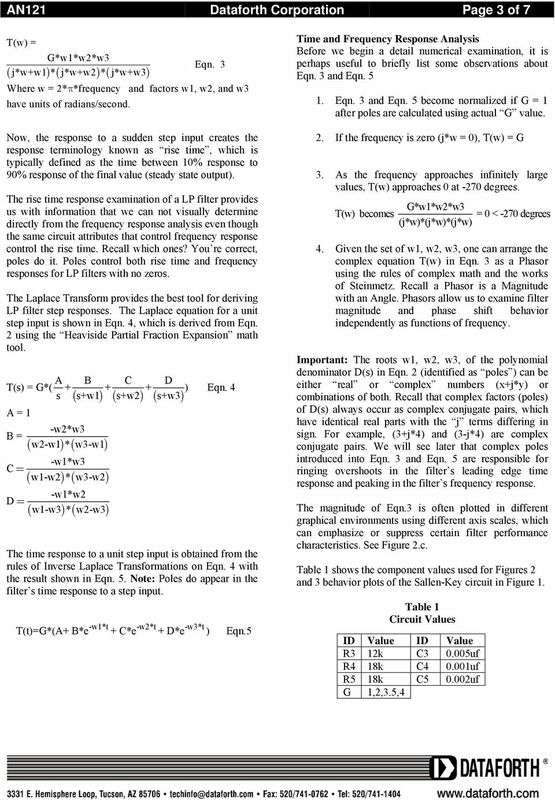 1 of 6 09/27/2006 05:42 PM Tutorial: Basics of choosing and designing the best filter for an effective data-acquisition system By Bonnie C. Baker, Senior Applications Engineer, Texas Instruments, Inc.
Analog Filters. A common instrumentation filter application is the attenuation of high frequencies to avoid frequency aliasing in the sampled data.